↑ "Oklahoma at a Glance" (pdf). Oklahoma Department of Commerce. สืบค้นเมื่อ 2008-09-15. ↑ "State Personal Income 2006". United States Department of Commerce. 2007-03-27. สืบค้นเมื่อ 2008-09-15. ↑ "Gross Domestic Product by State (2005-2006)" (pdf). Oklahoma Department of Commerce. สืบค้นเมื่อ 2008-09-15. ↑ 8.0 8.1 "Annual Estimates of the Population of Metropolitan and Micropolitan Statistical Areas: April 1, 2000 to July 1, 2006". United States Census Bureau. Archived from the original (csv) on 2008-01-15. สืบค้นเมื่อ 2008-09-15. ↑ 9.0 9.1 "Oklahoma, All Terrain Vacation". TravelOK. TravelOK.com. 2006-01-12. สืบค้นเมื่อ 2008-09-15. ↑ Greymorning, Stephen. "Profiles of Native American Education Programs". Southwest Educational Development Laboratory. สืบค้นเมื่อ 2008-09-15. ↑ "Registration by Party as of January 15, 2007" (pdf). Oklahoma State Election Board. Oklahoma State Election Board. 2007. สืบค้นเมื่อ 2008-09-15. ↑ "Oklahoma State History and Information". A Look at Oklahoma. Oklahoma Department of Tourism and Recreation. 2008. สืบค้นเมื่อ 14 September 2008. ↑ Merserve, John (1941). "Chief Allen Wright". Chronicles of Oklahoma. สืบค้นเมื่อ 2008-08-10. ↑ "Oklahoma History". Ponca City Info. Ponca City Information.com. 2008-08-08. ↑ "THE WEST - Events from 1500 - 1650". PBS. สืบค้นเมื่อ 2008-09-13. ↑ "Trail of Tears". ngeorgia.com. สืบค้นเมื่อ 2008-08-27. ↑ "Oklahoma (Indian Territory)". Civil War Traveler. สืบค้นเมื่อ 2008-09-15. ↑ 18.0 18.1 "History of Oklahoma". The History Channel. สืบค้นเมื่อ 2008-08-28. ↑ "Contributions of the Indian people". Oklahoma State University. สืบค้นเมื่อ 2008-09-15. ↑ "Tulsa Area History". Tulsa County Library. สืบค้นเมื่อ 2008-08-28. ↑ "Tulsa, Oklahoma City History". Bycitylights.com. สืบค้นเมื่อ 2008-09-13. 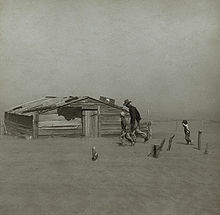 ↑ "1930s Dust Bowl". Cimarron County Chamber of Commerce. 2005-08-05. สืบค้นเมื่อ 2008-09-15. ↑ "History of the States: Oklahoma, The Sooner State". The History Channel. 2007. สืบค้นเมื่อ 2008-08-29. ↑ "Oklahoma Symbols, State Song: Oklahoma!". State History Guide resources. สืบค้นเมื่อ 2008-09-10. ↑ "The OKC Bombing". The Sight. 2008. สืบค้นเมื่อ 2008-09-10. ↑ "Oklahoma City bombing". Answers.com. 2008. สืบค้นเมื่อ 2008-08-29. ↑ "Land and Water Area of States, 2000". Information Please. 2000. ↑ "About Oklahoma". Travel OK.com. 2008. สืบค้นเมื่อ 2008-08-06. ↑ 30.0 30.1 "Oklahoma's Climate: an Overview" (pdf). University of Oklahoma. สืบค้นเมื่อ 2008-09-15. ↑ 31.0 31.1 Arndt, Derek (2003-01-01). "The Climate of Oklahoma". Oklahoma Climatological Survey. สืบค้นเมื่อ 2008-09-15. ↑ "Tornado Climatology". NOAA National Climatic Data Center. สืบค้นเมื่อ 2008-08-06. ↑ Novy, Chris. "SPC and its Products". NOAA. สืบค้นเมื่อ 2008-09-15. ↑ "Oklahoma Weather And Climate". UStravelweather.com. 2007. สืบค้นเมื่อ 2008-09-15. ↑ "Weather Averages: Lawton, Oklahoma". MSN Weather. สืบค้นเมื่อ 2008-09-15. ↑ "State and County Quickfacts - Metropolitan Statistical Area". United States Census Bureau. สืบค้นเมื่อ 2008-09-15. ↑ 38.0 38.1 "Oklahoma Census Data Center News" (pdf). Oklahoma Department of Commerce. July 2007. สืบค้นเมื่อ 2008-09-15. ↑ "Oklahoma Municipal Government" (pdf). Oklahoma Department of Libraries. 2005. สืบค้นเมื่อ 2008-09-15. หน้านี้แก้ไขล่าสุดเมื่อวันที่ 10 มกราคม 2562 เวลา 22:09 น.